The most famous, and one of the wealthiest, AFL clubs in the land, the Collingwood Magpies, led by the ubiquitous Eddie McGuire, has always been on the front foot when it comes to innovative ideas. The Magpies, and indeed all sporting clubs, have deep ties to the community they exist in. So it’s no wonder that the Pies are pioneering “Sports Lottery” on-line in Australia – a method popular in Europe to raise additional revenue for sporting clubs, and at the same time raise funds for important charity work. Sports Lottery has been a roaring success in Europe, and now it’s coming to Australia. To give you an idea of the scale we are talking about here, Postcode Lottery in the UK generates €1.5 billion in revenue and contributes €613 million to charities, and so the concept could prove very valuable to charities and sporting organisations alike here in Australia too. The Magpie Millions will support Collingwood’s many community initiatives, but there are plans afoot to extend this to other AFL clubs and beyond. Collingwood Football Club will partner with Plus Connect – Activistic (ASX: ACU)’s acquisition target. ACU recently confirmed a synergistic play to acquire Plus Connect , a private tech company that targets traditional lottery customers while supporting charities and not for profits. 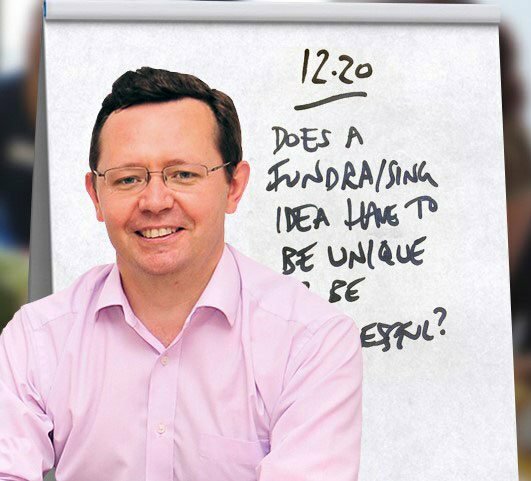 With an estimated market size of $600million annually for Sports and Charity Lottery in Australia, ACU now has its hands on one of those classic ‘first mover’ opportunities. At the same time, ACU is a speculative tech stock, so there is no hard and fast guarantee this will be successful. Investors should seek tailored financial advice before investing in small tech stocks such as ACU. 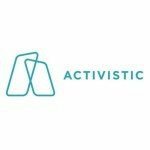 For those new to Activistic (ASX: ACU), this $10M capped company owns and operates an established micro payments platform that facilitates donor giving and reduces the percentage of a donation that goes to middlemen and donation brokers. 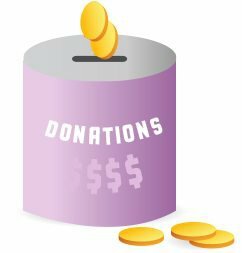 It’s really a fairly simple model that transfers a much higher portion of a donor’s money to the charity that needs it, based on the donor donating via an additional line item on the telephone bill. 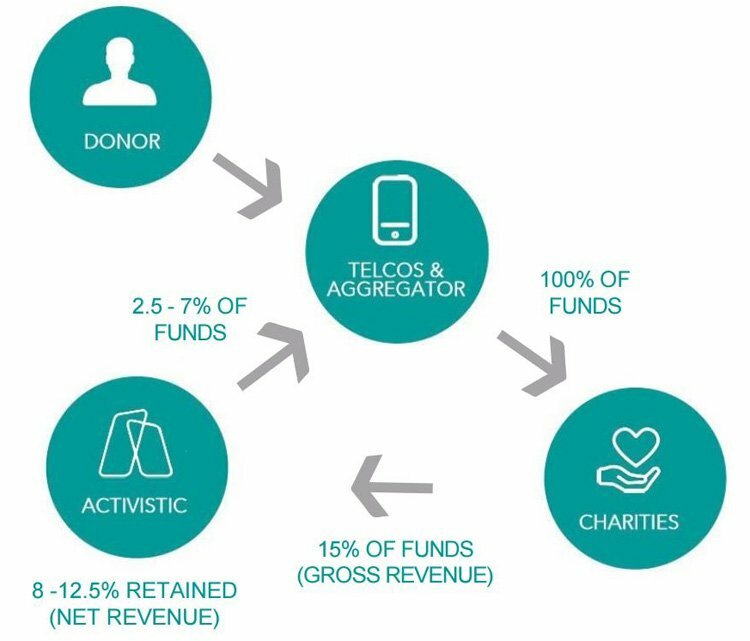 ACU has two operating products, Veteran’s Call , that works with veterans charities in the US, and Ralli , a UK based app that facilitates giving to a wide range of supporting charities. The presence in both the US and UK means this is truly a global operation, with all the scalability inherent in that. But up until now, it hadn’t had a presence in Australia due to complications with local telcos. That is all about to change with news of ACU’s planned acquisition of Plus Connect. The acquisition of Australian company Plus Connect will bring together a socially responsible wagering model with the app-based donations and fundraising model of ACU. This acquisition neatly stitches together ACU’s vision of assisting funding and giving, with 21 st century fundraising solutions – like online lotteries. Plus Connect has two products that it is developing, and both involve lottery models to raise the big bucks. This could result in significant benefits for shareholders from both companies, as the partnership will create synergy across operations, strategy, finance and more. We’ve seen how fundraising lotteries can transform organisations and sporting teams – it was the national lottery in the UK that was credited with ‘transforming Great Britain into a behemoth’ at the Rio Olympics, after all. Plus Connect’s charity weather lottery, which is already up and running, currently supports four existing charities. The Collingwood Football Club (AKA the Magpies, AKA the Pies) has agreed in principle with Plus Connect to develop and commercialise a range of online sports lottery-style products specifically made for Australia. Both parties have agreed in principle to create an exclusive joint venture – ‘Sports Lottery Australia Pty Ltd’ – and create some key funding streams for good old Collingwood as a club, but also their numerous community-based activities. And there are endless amounts of fish in that sea, particularly in the Australian market. Actually, lotteries have long been used as exceptional funding tools not just by sporting organisations and clubs, but by charitable or non-profit organisations worldwide. Australians love to take a punt – they also love it when you can add in a bit of altruism. Still, this deal is not 100% finalised, so caution is recommended if considering an investment. Don’t base an investment entirely on one pending deal alone, consider a range of factors including your own personal circumstances and risk profile. Plus Connect makes an attractive acquisition prospect for ACU for a whole basket of reasons, least of which is how quickly they can move via existing revenue models. Plus Connect’s commercial products are designed with significant profit margins in mind, ranging 30-50%. On the topic of money, let’s look at how that side of the deal is likely to play out. As Plus Connect is a public but unlisted company, the transaction will be an off-market takeover offer to acquire. Following are the terms regarding the proposed deal – a total consideration of 180 million ACU ordinary shares, plus an additional 12.5 million ACU shares to be issued to a Plus Connect creditor in satisfaction of a $250,000 debt. As well as that, each Plus Connect shareholder will receive 3.0779 ACU ordinary shares for each Plus Connect share held; and 56.4% of Plus Connect shareholders have agreed to voluntarily escrow their ACU shares for a period of 12 months. All going well, the transaction is scheduled to be wrapped up by early December. A reliable revenue stream is a good thing to have when dealing with the sometimes volatile world of fundraising and donations. Plus Connect also boasts a low break-even point for their two current lottery products. Via charity lottery, already up and running, the company is targeting a net revenue of $712,500 per month from less than 100k customers each paying $25 a month. Meanwhile off the back of the Sports Lottery concept, the company is targeting a similar revenue number of around $762,500 per month. Adding to the compelling case for this transaction is the clean entry it offers ACU into the Australian market, a step that until now had proven difficult for the company. Tapping into their home markets would also mean hitting separate, but similar, customer-bases while maximising the expertise of one unified team with cross-pollination across technical expertise and general support services. Opportunities for cross-selling across platforms certainly won’t hurt ACU’s push for publicity, either. Speaking of publicity – ACU is in multiple advanced discussions with celebrities which could provide important endorsements and validations of its technology and get that mass uptake the company would like to see. In the company’s biggest news outside the Plus Connect deal, ACU announced in October a new white label contract with US Congressman Joe Garcia . The app used for Garcia’s campaign will use similar backend infrastructure to ACU’s Veterans Call app which has secured several key partnerships in the last 12 months . The news marks the company’s first white label app, and given the popularity and scope of Garcia’s campaign (endorsed by Hillary and Bill Clinton, President Obama, VP Joe Biden and more), it’s a big first go in the highly lucrative political giving space. For those unaware, the term ‘white label’ refers to the development of software for a third party, wherein the program is licensed to be used under their own brand. In simple terms, it means ACU’s brand is not on the final product, but it still gets paid as if it were. The efficacy of the product, as proven through white label successes, could be easily leveraged by the company to broker similar deals in future. And that’s what they’re doing, not just in politics but in their primary purpose of working with charities. As we have covered extensively in the past , ACU’s first foray into the US was via the Veterans Call product, which currently has 12 charity partnerships in place. The latest version was launched in August and received a high rating on Google Play and the App Store. 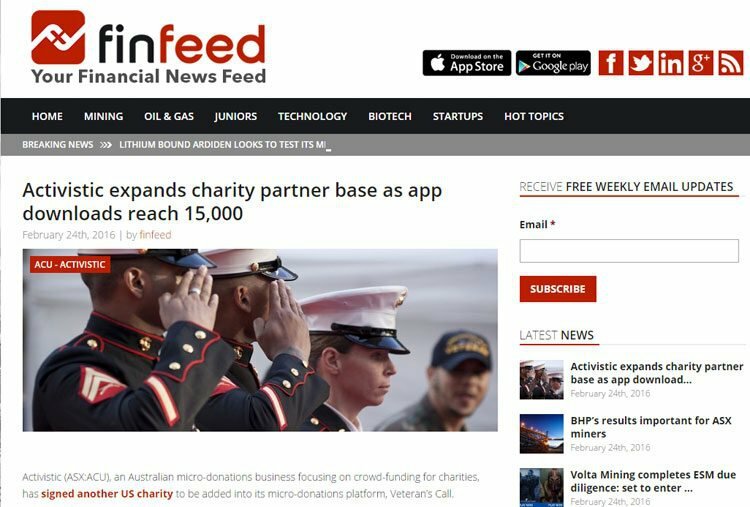 Partner orgs are promoting the app, and it’s set to get air time in the US as part of Veterans Day campaigns in the middle of November, as well as ‘Giving Tuesday’ – another veteran-supporting day landing towards the latter end of the month. Partnering opportunities also exist with global festival and concert organisations... and we would assume that a high-profile festival endorsement of the product could see it really take off. Blue Star Families aim to bridge the gap between military family communities and the general public by providing free resources, services and opportunities to make life more sustainable for military families. They’re also the latest charity get on board the Veterans Call train. With a vast public reach that includes Facebook, Uber, Disney, The Clinton Foundation and McDonald’s, this is another big win for ACU. 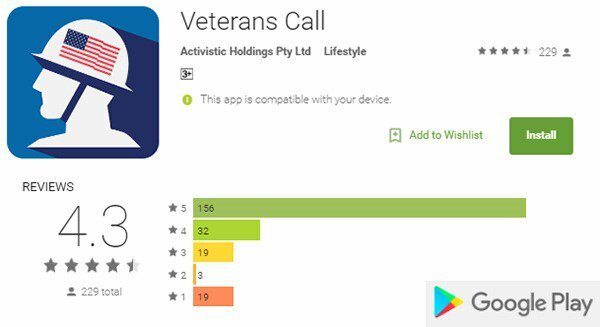 Downloads of Veterans Call reached 110,000 in July, around the time well-known veteran and philanthropist J.W. Cortes threw support behind it, using his social media presence to reach over 18 million people. Here’s a simple comparison with competitor PushPay – a mobile app company in New Zealand who enable mobile payments between merchants and customers, predominately in the faith and charity sectors – however PushPay has been around for years longer than ACU. ACU (on the left) have a much smaller market cap than Pushpay (ASX:PPH) (on the right). Both currently have negative cash flow – but ACU have plenty opportunities coming up which are likely to see its market cap grow rapidly, and hopefully catch up to Pushpay over the coming months and years as ACU’s product evolves. At the same time, ACU is in its early days, and like all small tech stocks, there is no guarantee an early investment will be successful, so apply caution to any investment decision. Pushpay still use credit cards and traditional mechanisms for payment, whereas ACU’s software uses direct carrier billing with minimal fuss or effort on the part of the donor, which is a key competitive advantage. All of this paints a pretty picture for ACU investors. The pending acquisition of Plus Connect, who is stitching up a deal with the Collingwood Football Club, is a well thought-through game plan where all paths lead to high visibility, high uptake of users and strong partnerships on an international level. ACU’s new suite of products can expand to high profit margin products, with a finger in both the web-based and app-based pies. In a few weeks’ time we’ll see their marketing kick off, an increase in news flow, announcements of partnerships, and hopefully news of formalisation of the Plus Connect deal.